A big thanks to Dorothea Mackellar for this rigorous historical documentation of climate change, written before any real increases in industrial atmospheric carbon di-oxide, and before our modern, scientific understanding of the Indian Ocean Dipole or the El Nino Southern Oscillation. It is time that our Prime Minister, the Chief Scientist, ABC presenters — including Tony Jones, Robyn “100 metres” Williams and Jon Faine — and all those other soppy green environmentalists with weak or wishful memories, reread this wonderful poem. I should remind them that the poem was written in 1906, just in case they think it was written about our recent, inexplicable ‘extreme’ weather events caused, according to these fools, by global warming. This entry was posted on December 2, 2010 at 14:34 and is filed under climate change, politics, science. You can follow any responses to this entry through the RSS 2.0 feed. Both comments and pings are currently closed. It’s so nice to know that there are people who can confidently dismiss the consensus of scientists who have studied the data as fools. 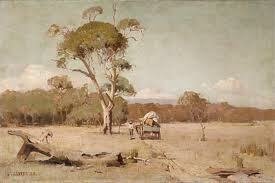 Yes, there have always been droughts and bushfires and floods. That says nothing at all about the evidence for human contribution to climate change. It is they who make the claims. As Christopher Hitchens once said about the religious, if they assert without evidence, then I can dismiss without evidence. The problem is that there IS no evidence. Read my latest blog. Just because CO2 is going up, and temperatures are going up only demonstrates a correlation. It in no way proves a causal link. This, in a sentence, is the problem. Read Lord Monkton in todays Australian. Droughts and floods ? Yes, we notice them more now because more idiots have forgotten history and think they can live on flood plains, or farm in the Mallee.